Florida-based trainer Michelle Nihei has not made a trip to Churchill Downs since the spring of 2013 but on Saturday, the former neuroscientist, hopes her journey to Kentucky will lead to a start in the Breeders’ Cup Juvenile (Grade I) with Royal Urn in the $150,000 Iroquois Stakes – a “Win and You’re” in event for the Nov. 2 championship race. “Florida racing is tough over the summer,” Nihei said. “We’re holding our own and have some good horses down there. This was a logical spot to send this horse to try and get back to the Breeders’ Cup. Prince Will I Am raced at Churchill Downs five times throughout his 19-race career, most notably crossing the wire second in the Breeders’ Cup Marathon (GIII) in 2010 but was disqualified and placed 10th due to interference. Unlike many trainers, Nihei did not grow up on the racetrack and was actually a neuroscientist prior to taking out her trainer’s license in 2007. The complete Iroquois field from the rail out (with jockey, trainer, assigned weight and morning line odds): Mr Wrench It (Euclyn Prentice Jr., Coty Davidson, 120 pounds, 30-1); Royal Urn (Reyes, Nihei, 118, 12-1); Drunk as a Skunk (Joe Rocco Jr., Doug Anderson, 118, 30-1); Tight Ten (Ricardo Santana Jr., Steve Asmussen, 118, 2-1); My Sixth Sense (Shaun Bridgmohan, Mark Casse, 118, 10-1); Tobacco Road (Julien Leparoux, Asmussen, 120, 6-1); Pole Setter (Florent Geroux, Brad Cox, 118, 6-1); Cairo Cat (Brian Hernandez Jr., Kenny McPeek, 118, 8-1); Manny Wah (Channing Hill, Wayne Catalano, 118, 8-1); Hog Creek Hustle (Corey Lanerie, Vickie Foley, 118, 10-1); Synthesis (Drayden Van Dyke, Keith Desormeaux, 118, 12-1); and Everfast (Robby Albarado, Dale Romans, 118, 12-1). GELNER HOPES UNDEFEATED TAYLOR’S SPIRIT CAN NOTCH HER THIRD STAKES VICTORY IN SATURDAY’S POCAHONTAS WITHOUT HIM IN ATTENDANCE – Trainer Scott Gelner last saddled Taylor’s Spirit just 12 days ago in the $60,000 Happy Ticket at Louisiana Downs but the 51-year-old horseman will not be at Churchill Downs on Saturday to watch his undefeated filly compete in the $200,000 Pocahontas (Grade II). Instead, he will renew his wedding vows with his wife, Felicia. Owned by Norman Stables and Mark Norman, Taylor’s Spirit bested five rivals by 3 ¼ lengths in the one-mile Happy Ticket run over the turf course at Louisiana Downs. The bay filly previously won the Prairie Gold Lassie on dirt at Prairie Meadows by 3 ¾ lengths. 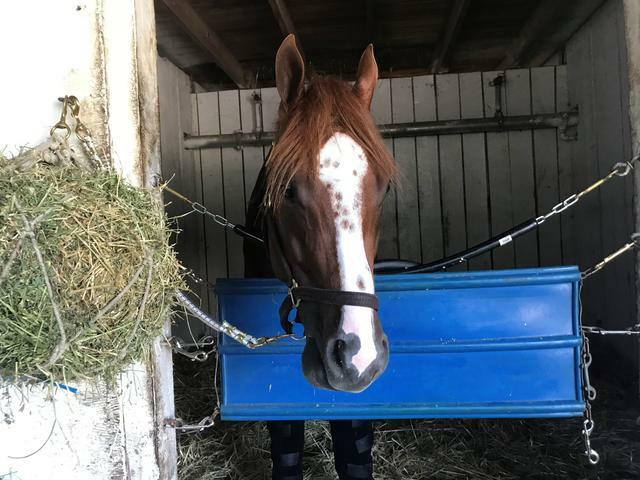 Taylor’s Spirit, an $80,000 purchase from the 2018 OBS April Sale, has been primarily based at Prairie Meadows in Iowa and Evangeline Downs in Louisiana but will now join Gelner’s string of horses at Trackside Louisville – Churchill Downs’ satellite training facility located five miles from the main track. The field for the Pocahontas, in order of post position (with jockey, trainer, assigned weight and morning line odds): Serengeti Empress (Corey Lanerie, Tom Amoss, 120 pounds, 5-2); Love My Honey (Julien Leparoux, Mike Maker, 118, 6-1); My Wynter Rose (Cory Orm, Tommy Short, 118, 50-1); Profound Legacy (Brian Hernandez Jr., Ian Wilkes, 118, 20-1); Splashy Kisses (Drayden Van Dyke, Doug O’Neill, 118, 4-1); Lightscameraaction (Robby Albarado, Kenny McPeek, 118, 20-1); Include Edition (James Graham, Vickie Foley, 118, 30-1); Two Dozen Roses (Ricardo Santana, Todd Pletcher, 118, 6-1); It Justhitthe Wire (Joe Rocco, Kiaran McLaughlin, 118, 6-1); Taylor’s Spirit (Shaun Bridgmohan, Gelner, 120, 8-1); Saved At Dawn (Fernando De La Cruz, Brad Cox, 118, 15-1); and Tapping Pearl (Florent Geroux, Mark Casse, 118, 10-1). CALHOUN OPTOMISTIC GRANDGRAN CAN SHOW EARLY PROMISE AS HIS DAM GRAN LIONESS – There are nine 2-year-old maiden races carded over the opening three days of the September Meet at Churchill Downs with many horses making their first-career starts. One of those horses, who hopes to win on debut as his dam Gran Lioness did in 2010, is Wayne Sanders and Larry Hirsch’s Grandgran for trainer Bret Calhoun. Gran Lioness, who trained three years under Calhoun’s care, won two stakes races and was Grade III placed in the Rachel Alexandra (GIII). Grandgran is entered in Race 6 Saturday, a one-turn, one-mile, maiden special weight contest with jockey Gabriel Saez aboard. “It was actually around this time last year when I saw this horse go through the ring at the (Keeneland September Yearling) sale and we decided to buy him,” Calhoun said. The son of Super Saver was purchased for $125,000 and has been training at Churchill Downs since late June. Saturday’s 11-race program has a first post of 12:45 p.m. (all times Eastern) and Race 6 has a post time of 3:16 p.m.
OPEN MIND, LOCUST GROVE KICK OFF OF SATURDAY’S ALL-STAKES PICK 4 – Saturday’s 11-race program at Churchill Downs features an all-stakes 50-cent Pick 4 that will begin in Race 8 with the $100,000 Open Mind and $100,000 Locust Grove (Grade III). The six-furlong Open Mind field is led by 7-5 morning-line favorite Vertical Oak for owners Kirk and Judy Robison and Hall of Fame trainer Steve Asmussen. The filly was most recently second in the Honorable Miss (GII) at Saratoga. The Open Mind field from the rail out (with jockey, trainer, assigned weight and morning line odds): Thirteen Songs (Robby Albarado, Dallas Stewart, 120, 30-1); P Boo (Jack Gilligan, Kirk Harris, 120, 20-1); Vertical Oak (Ricardo Santana Jr., Asmussen, 120, 7-5); Courtmewithcarats (Sammy Camacho Jr., Clarke Vesty, 120, 50-1); Our Majesty (Corey Lanerie, Ron Moquett, 120, 8-1); Miss Kentucky (Brian Hernandez Jr., Rusty Arnold II, 122, 2-1); Astrollinthepark (Gabriel Saez, Larry Jones, 120, 2-1). In Race 9, Merriebelle Stables’ Fleur de Lis Handicap (GII) winner Blue Prize (ARG) tops the 1 1/16-mile Locust Grove as the 2-1 morning line favorite for trainer Ignacio Correas IV. The all-stakes Pick 4 will close with the $150,000 Iroquois (GIII) (Race 10) and $200,000 Pocahontas (GII) (Race 11). Post time for Race 8 is 4:21 p.m. ET. DOWN THE STRETCH – Jockey Adam Beschizza will serve a three-day suspension beginning Sunday after he was disqualified in the Kentucky Downs Juvenile Turf Sprint Stakes on Saturday due to interference in the stretch, according to agent Liz Morris. … Top sprinter Mind Your Biscuits trained for the first time at Churchill Downs on Friday morning for trainer Chad Summers as he began preparation for the Sept. 29 Lukas Classic (GIII) and Breeders’ Cup on Nov. 3. The colt is expected to gallop Saturday at 5:30 a.m., according to Summers. … Those attending Saturday night’s NCAA football game between UofL and WKU at nearby Cardinal Stadium can get their party started early at Churchill Downs free of charge. Ticket-holders to the game will receive free admission to the track simply by showing their game tickets at Churchill Downs admission gates. … The 2019 Kentucky Derby Winner’s Trophy will be on display in the Woodford Reserve Winner’s Circle for the Iroquois. … An In Memoriam video tribute to John Asher will be shown on the Big Board immediately after the Locust Grove and prior to the Iroquois.